From Goodreads ~ "Perfect" is a purely subjective term when it comes to art. A journey toward the perfect photo is a journey without a defined destination. There are photographs that are technically perfect and others that stand out because of their message or composition. Although the perfect photo remains a matter of taste, it is still something every photographer strives for. 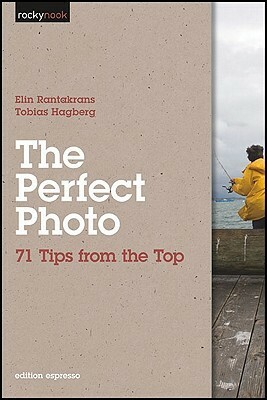 With this volume, Elin Rantakrans and Tobias Hagberg provide the beginning to intermediate photographer a wide range of practical tips that cover capture, composition, and editing—all with the aim of helping you achieve better photos. Each concept is illustrated with beautiful, inspiring images. Our promise: Use 7 of these 70 tips and you will be a 10% better photographer. Try it! I have three cameras ... a Canon point-and-shoot that is usually in my purse, a Nikon D5100 DSLR along with some lenses, and a Nikon CoolPix (that's in between the two) that I use often. Needless to say, I take a lot of pictures. Gord and I took some classes last year to learn how to (1) use our cameras in other than auto mode and (2) take photographs, not just pictures. I'm still an amateur and like reading photography books to see what professionals take pictures of and how they do it. Yes, there are 71 tips but they are only a couple paragraphs each. It doesn't get into how to do anything ... it basically says something can be done and then you have to go look for another book to show you how. This book is marketed to the beginner to intermediate photographer ... I didn't find there was a lot of substance.